Build your own guide for an exhibition. Just upload the content you want to share with your audience. You can use texts, audios, videos, GIFs or maps – whatever makes sense for your purpose. Create your own tourguide for a citywalk. Just upload the content you want to share with your audience and enjoy the benefits of infinite scalability and more user engagement with your visitors. You have a special story to tell? You want to get into an innovative dialogue with you customers? You need an automated customers service? We can help. You want to meet us in person and see first hand how helloguide could benefit your organisation? Click on one our upcoming events and schedule an appointment with us. We’re looking forward to meet you! 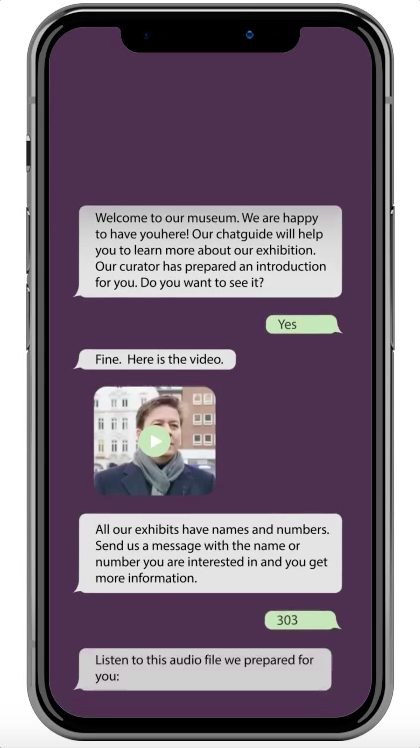 “The chat guide brings the museums´ exhibits into the city and makes them available for a broader public. See how easy helloguide is!